Vineyarders clinch tourney berth with home victory. 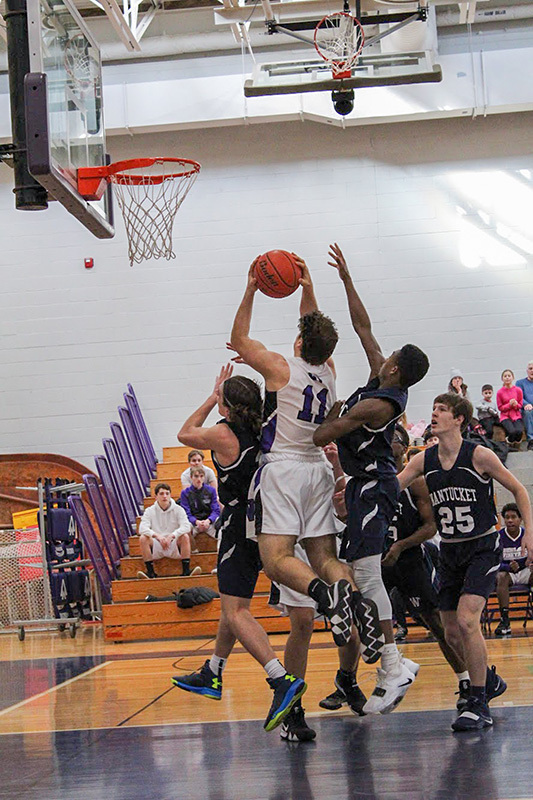 In a game that had all the earmarks of a heavyweight fight, the Martha’s Vineyard Regional High School (MVRHS) boys basketball team battled their way to a 62-54 win over an equally tenacious Nantucket team at the high school on Sunday. This highly entertaining game featured aggressive but clean play throughout, with each team clamping down on defense, crashing the boards on both ends, and treating every loose ball like it was the Hope Diamond. It was outstanding basketball. The contest was loaded with significance. With a 13-3 record, Nantucket had qualified for the tournament, and hoped to earn a higher seed with additional wins. 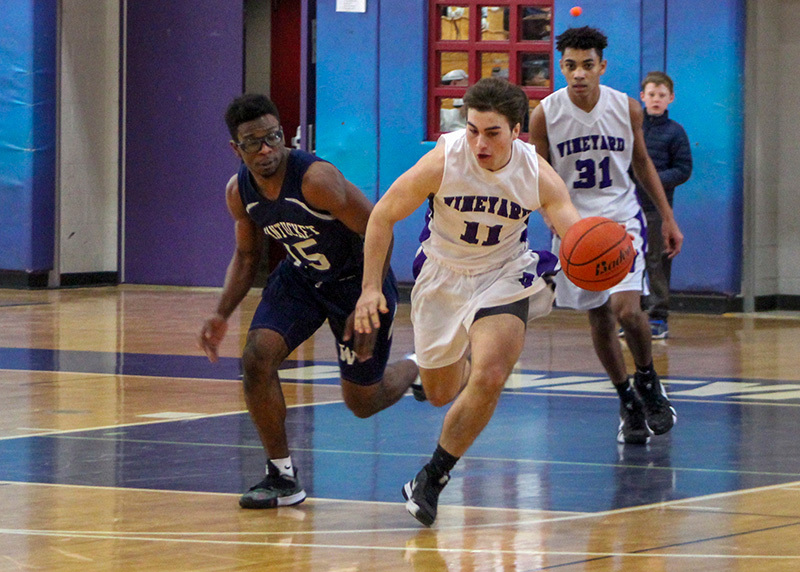 The Vineyard, at 9-6, needed one more victory to gain a postseason berth. On top of that, the archrival Whalers had dominated the Vineyard at home in their previous matchup last month. Both teams came out strong on defense, the Whalers in a full-court zone press — falling back to a 2-3 zone — and the Vineyarders applying full-court man-to-man pressure. The action was fast and furious. The first four minutes were even, as each squad created turnovers off their press for open shots and layups. Gradually the Whalers’ speed and swarming press, led by junior Torane Burton, gave the visitors some momentum. Quick traps and quicker hands resulted in deflections, steals, and baskets. By quarter’s end Nantucket had themselves a seven-point lead. The insertion of junior Jared Regan at point guard to start the second period jump-started the offense. His sharp passing, mixed with accurate shooting and occasional drives, opened things up. Meanwhile, the hosts employed a 2-3 zone to stymie the Whaler offense. 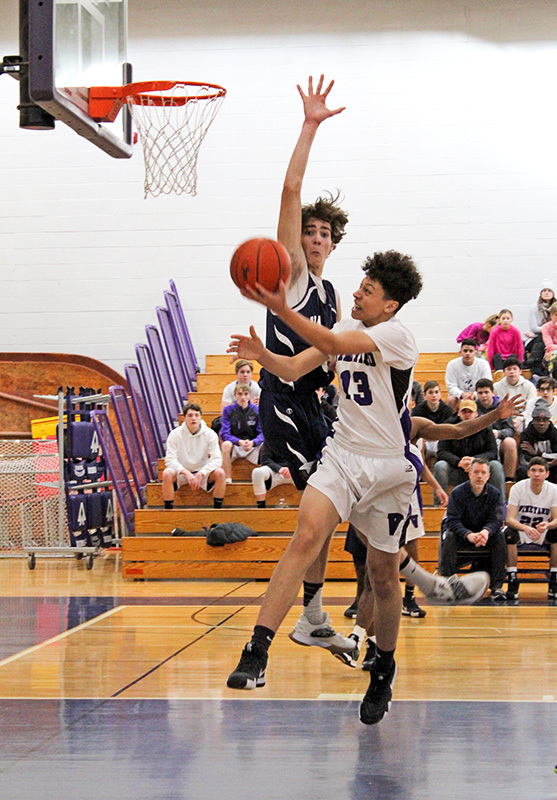 Although the Vineyarders would cut the lead to four on a putback by sophomore Rammon Dos Santos at the 1:30 mark, the visitors closed out the half with a late surge, and led 30-24 at the half. Coach Joyce did more than deliver strong words to his team. He also installed a full-court 1-1-3 zone defense that turned the game around. The press forced the Whalers to bring the ball up one side or the other. When a Vineyard trap was sprung, the only open pass was cross-court where another Vineyarder was waiting. The hosts scored the first five points of the quarter on their way to an 18-12 third-quarter advantage and a 42-42 tie. A chunk of that offense came from the lightning-quick Vineyard senior Dylan Dyke. He is a constant offensive force on the court. Give him an inch and he will drive the length of the court to beat a press or elude a corner trap, then reverse-dribble and hit a jumper or penetrate to the hoop. Dylan finished the game with 19 points. 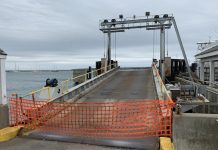 The fourth quarter belonged to Martha’s Vineyard. The pace again was hectic, and the action resembled rugby at times as both teams scratched for rebounds and loose balls. The confident hosts pulled away by 10 points, getting key contributions from co-captain Sam Wallace, who was fierce on the boards and hit two big baskets. The 62-54 final was a good indication of the difference between two fine teams on this day. “We settled down well in the second half,” said Coach Joyce. ”We got huge contributions from our seniors.” Among those contributions were the relentless rebounding of co-captain Matt Morris and the gluelike defense of Owen Porterfield off the bench. 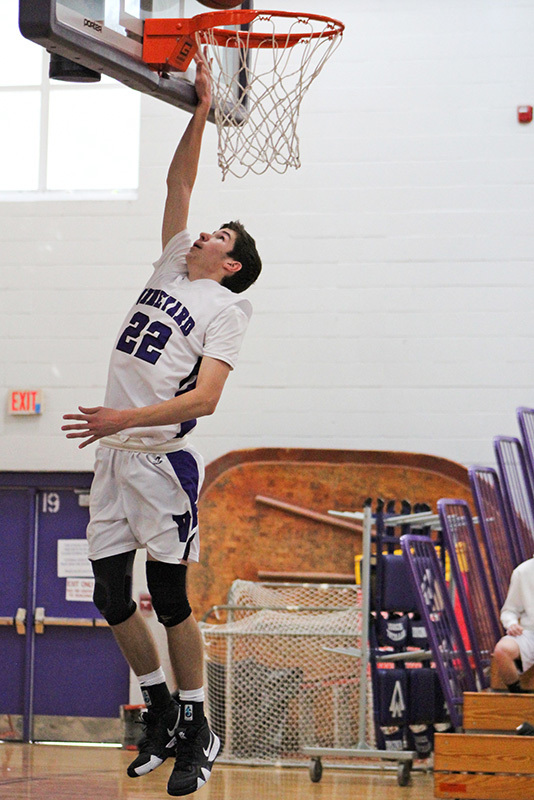 Dylan Dyke’s 19 points topped Vineyard scorers; Jared Regan added 14. 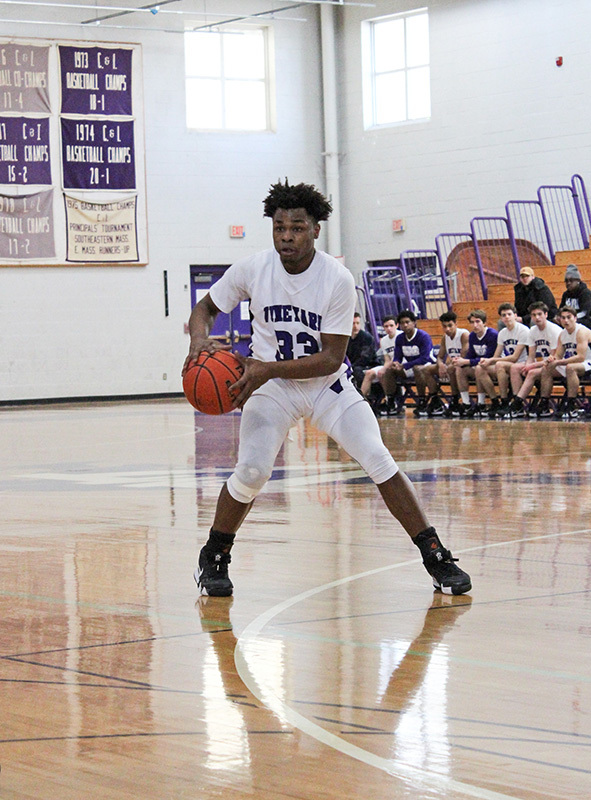 For the Whalers, Torane Burton had 20, while senior Victor Gamborini tallied 13 in an impressive all-around performance. The Whalers, now 13-4 on the season, host Monomoy Regional on Feb. 16. The tournament-bound Vineyarders, 10-6, travel to Mashpee on Tuesday, Feb. 12, before hosting Sandwich on Wednesday. It was a great game to watch and your article describes the game perfectly. 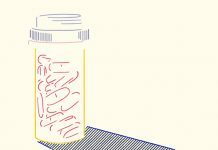 Nice piece of writing!